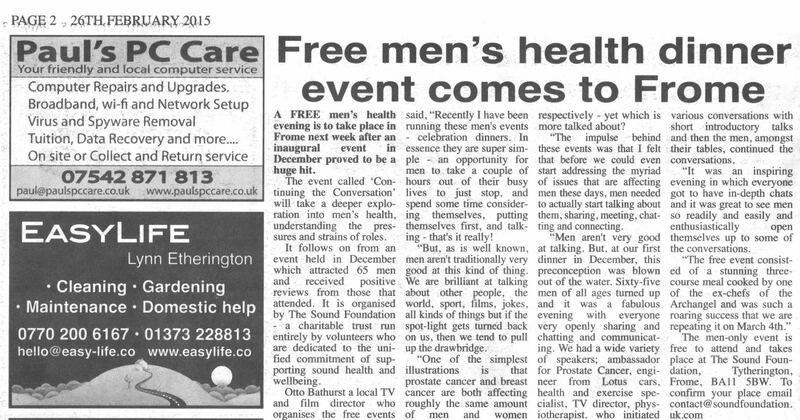 The Charity proudly sponsors the Men’s Health initiative ‘Starting the Conversation’ facilitating round table discussion and education regarding all aspects of men’s health and wellbeing, with particular focus on offering the space and opportunity for men to get together under one roof to raise awareness and dialogue on issues such as cancer (specifically prostate with a guest speaker from Prostate Cancer UK) work/life balance, relationships and to inspire them to start talking about these topics amongst themselves. 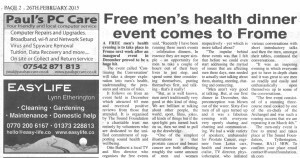 The first event in December 2014 was a huge success, with many men experiencing for the first time the encouragement to open up about their health concerns as other men stepped forward to share and engage. Due to popular demand, the December dinner was followed up with another dinner in March 2015, and a third dinner is planned for Autumn 2015. All men invited.